A group of municipalities and organizations have a plan to connect a series of trails on the west side of Lake George, aiming to make the region a world-class hiking and biking destination. The towns of Bolton, Hague, Lake George and Ticonderoga and the village of Lake George have partnered with organizations such as the Adirondack-Glens Falls Transportation Council and the Warren County Safe and Quality Bicycling Organization, to put together a pitch for a continuous trail system on the west side of the lake that cites economic, health, environmental and community identity benefits. The three towns and the village received a $69,000 state grant last year, through the Department of Environmental Conservation’s Smart Growth program, to fund the study. The plan calls for connecting existing hiking and biking trails on the west side of the lake, creating pedestrian connections on roads and bike racks. “It’s amazing how few resources are integrated into the landscape,” Clothier said. Clothier attended meetings for each of the municipalities in the fall to solicit public input on the plan. The resources that are available include 18 major trail hubs from Lake George to Ticonderoga, four nature reserves, a network of snowmobile trails and about two dozen parks. During an end-to-end trip on the Erie Canalway Trail, cyclists can spend up to $1,500 each, while multi-use trails and cycling projects generally create between nine and 12 jobs, Clothier said. Some of the existing trails that would become part of the network have capacity issues, including those on Cat and Thomas mountains in Bolton and Prospect Mountain in Lake George, Clothier said. There’s also not a strong relationship between trail use and area businesses, and there aren’t many trails that cater to seniors, young children and physically challenged people, Clothier said. There are a lot of cyclists who are being introduced to the area, said Bolton Supervisor Ron Conover, noting the Centurion Cycling event that was held in Lake George last summer. “One of the major questions we get at the visitor’s center is ‘where do we go to hike and bike?’” Conover said. The state last month purchased Cat and Thomas mountains in Bolton from the Lake George Land Conservancy, which already includes an extensive trail system, which was an important part in the plan to implement the trail connections. Clothier’s presentation included “story boards” for each of the municipalities, highlighting the different resources and whether the trail system there has cell service and if dogs are allowed. 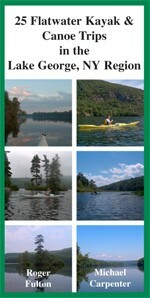 Guidebooks for enjoying the trails and waterways of the Lake George area can be found at www.footprintpress.com. The New York State Underwater Blueway Trail Project is searching for potential dive partners to participate in the project. The UBT will include the Village of Lake George (Lake George), Villages of Freeport (Atlantic Ocean), the cities of Dunkirk (Lake Erie), Geneva (Seneca Lake), Oswego (Ontario Lake) and Plattsburgh (Lake Chaplain). Initially, they will be starting with Geneva and Oswego. This project is to document, promote and preserve shipwrecks and other underwater cultural resources in New York waters and establish underwater scuba trails through dive sites. For more info contact rparker@stny.rr.com. Here’s a report by Adirondack Explorer editor Phil Brown on his recent trip into a Hague mine (near Lake George) that used to house the largest population of bats in New York State. Adirondack Almanack has covered the decline of the state’s bats since 2006 thoroughly. Click here to read all of their stories about bats. 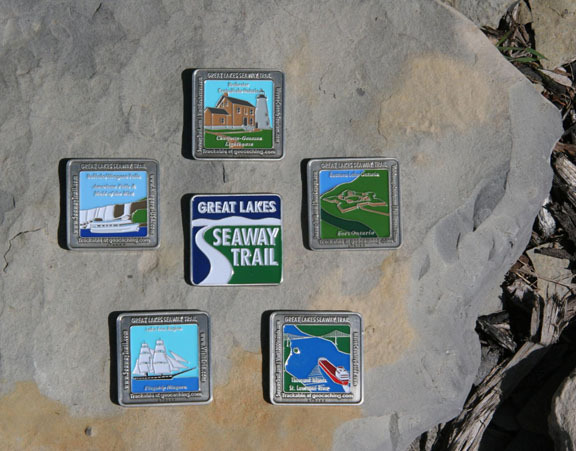 The new Great Lakes Seaway Trail GeoTrail Coins are here! The elegant, antique metal-finish tokens celebrate the waters and history of the 518-mile-long America’s Byway that is host to a new 75-cache adventure for those who enjoy exploring by latitude and longitude. The series of five coins features the Flagship Niagara, Niagara Falls and the Maid of the Mist tour boat, Charlotte-Genesee Lighthouse, historic Fort Ontario, and a ship on the St. Lawrence River. Avid geocachers who have already located at least 10 caches in any of the byway’s five regions (Lake Erie, Buffalo/Niagara Falls, Rochester/Central Lake Ontario, Eastern Lake Ontario, and 1000 Islands/St. Lawrence River) can have their logbooks validated to receive the coin for that region. The Great Lakes Seaway Trail GeoTrail sponsors include VisitErie, the Niagara Tourism and Convention Corporation, VisitRochester, Wayne County Tourism, the Fair Haven Area Chamber of Commerce, the Cayuga County Office of Tourism, Oswego County Tourism, the 1000 Islands International Tourism Council, the St. Lawrence County Chamber of Commerce, and the Great Lakes Seaway Trail. From a short, family friendly “ice cream” ride to a 50 mile long designated state bike route, this book offers more than 25 options in between. Both on-road and off-road biking locations are covered. The 15 mile round trip, paved Warren County Bike Trail is included, as are segments of the connected, but unpaved, Feeder Canal Trail system. Off-road mountain biking locations are also covered in this comprehensive regional book. More than 60 photos, explicit directions from I-87 and GPS readings for trails and landmarks are all included. Bicycling opportunities abound in the Lake George Region, but only if you know about them. In this book they tell you where to go, how to get there and what you’ll find – because they’ve been there! Click here to read Matt’s review of a hike in Gull Bay Preserve, owned by the Lake George Land Conservancy. Click here for the Gull Bay Preserve web site.